Festivals | Heritage | Music | Art | Churches | Food | West African Tradition Gullah – pronounced GULL-uh – is the Creole language developed by enslaved Africans living along the Atlantic coast of South Carolina. It is also the name of the people who speak this language. The language is spoken by black, coastal residents of southern North Carolina, Georgia, and northern Florida too. On the Georgia sea islands, it is called Geechee. Here in South Carolina, the word Geechee is used to describe white natives of the sea islands, many of whom speak with a similar brogue. A Creole language is a language that takes words from two or more established vocabularies, mixes them up, and creates a new vocabulary altogether. In this case, the original languages were English and/or Scottish (the former spoken by planters and the latter largely by overseers) and African (spoken by slaves who were taken primarily from the Rice Coast of West Africa, but also from Angola, Calabar, Congo, and the Gold Coast). Gullah, both linguistically and culturally, is endangered. Creoles in general are unusual in America, and Gullah in particular is spoken only by a small set of people who descend from sea island slaves and continue to live near their birthplace. For centuries, Gullah survived and flourished as a result of rural isolation. However, as development overtakes South Carolina's sea islands, old ways are lost. The Gullah people are no longer able to live off their land and must find work in the city, leading to the loss of rich traditions. Schools and workplaces have become largely intolerant of the language, to the point where Gullah has now become something of a secret language, hidden away at home and church. 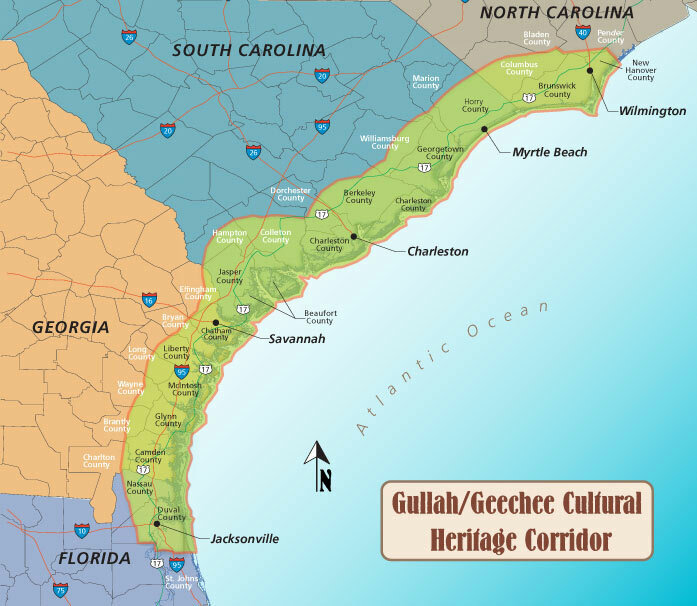 Although both Gullahs and South Carolina Geechees have thick accents, true Gullah is not easily understood by outsiders. It is spoken far more quickly and melodiously than English and includes an abundance of borrowed/altered words that are unfamiliar to most people today. Several local storytellers and coalitions have come forward to try to preserve Gullah language, traditions, and folklore. Nevertheless, development remains a tremendous threat. During the seventeenth, eighteenth, and nineteenth centuries, Senegalese, Gambians, and Angolans were captured by hostile tribes and sold to European and American traders who in turn sold them to plantation owners. South Carolina planters particularly valued salves from these regions because of many understood how to grow and harvest rice. Some believe Angolan slaves gave rise to the word "Gullah" through a shortened version of Angola – N'Gulla. Gullah Net - children can learn about Gullah culture, language, and traditions from Aunt Pearlie-Sue! Gullah Glossary - hundreds of words!